At long last, a book devoted to the life and art of the great illustrator Robert Fawcett has been released by the art publisher, Auad Publishing. It is a hard cover 9x12" book with a dust jacket, 182 deluxe pages, and a special foldout for Fawcett's well known Civil War panorama. The book was a labor of love for the publisher, who selected and edited the numerous color and black and white images used in the book. Those who know Mr. Auad know he spent years tracking down hard-to-find tearsheets and originals of Fawcett's art in order to make this the definitive collection of the famed draftsman's work. The book has an introduction by Walt Reed and the text is by yours truly. For a look at sample pages, or to order the book, go to the Auad Publishing web site. Any idea as to when it might be made available on Amazon? I have been waiting for a collection of Fawcett's work for years. All the pros say he was one of the best. More than excited than I can say to hold this one in my hands. Congratulations! Is it true that he was colorblind? Leland Purvis: I'm sorry, I don't. I checked with the publisher and they weren't certain either. Amazon is taking advance orders but they may not be able to fill them from the distributor for weeks. MORAN: Yes, he was known as "the illustrator's illustrator" for a reason. On the dust jacket, Mark English says "studying the work of Robert Fawcett when I was in art school taught me the importance of drawing." Murray Tinkelman also offered a quote, saying, "looking at a Robert Fawcett illustartion is a Master's Class in drawing, composition and story telling, goven by a true master." Mike Vosburg says, "Robert Fawcett was the consummate draftsman." And that's before you even open up the book. Amy June Bates: Yes, it's true that Fawcett was color blind. Award-winning illustrator Murray Tinkelman is also color blind and has some very interesting ideas about how that affects the work of a number of other color blind artists. Congratulations on a very worthy cause, David. I think Fawcett's sense of design is absolutely outstanding and learned and cannot be praised enough. Congratulations on this stunning contribution to art history, David. Ordered! Thank you so much! congratulations. I just ordered my copy. Been looking forward to this for the past year. I ordered the book last sunday about 50 yrs after buying Fawcett's "on the art of drawing"
I just ordered mine too. I've waited 20 years for this book and won't wait another 4 weeks for Amazon. Wow! I cannot wait to share this with my dad. Will order now. Images by a brilliant draftsman and artist and insight by an equally brilliant writer. That's a winning cocktail. Thanks for the heads up. Mine is in the mail. Congrats. I look forward to getting this. Fawcett is another one of those illustrators who should be included in those hefty History of Art books that weigh down UPS trucks driving to and from bookstores, warehouses and printing facilities nationwide. I think Fawcett is the most literary artist who ever lived. Maybe the only artist who took literariness in and of itself as his visual aesthetic? Surely this innovation alone would merit him inclusion in the pantheon, were the doors open to those who have traditional talents. If God is in the details, then Robert Fawcett's drawings are a Pantheon. I love the minutia of incidental information Fawcett captures in Sherlock Holmes' Man Cave shown above. Every element of the composition gives insight into Holmes' personality. Some elements are obvious - the microscope and chemistry set - show Holmes is a man of science. Others not so: the dagger perturbing at an angle out of the mantel and the box above the bookcase (dueling pistols?). I find myself looking for clues and inventing plot lines. Was Holmes Jack the Ripper comes to mind. Fawcett also has an eye for subtleties. Notice the refracted image in the glass flute of the lamp to the right and the windowpane at the pastor’s elbow. But something is not quite right with this particular image regarding color. 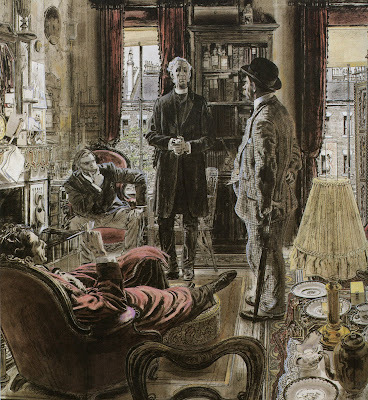 The dab of violet on the armchair at Holmes’ elbow; the opaque white added to the pastor’s hair and used to show highlights in the clothes of the standing figures don’t quite work. Were these last minute edits or perhaps this is evidence of Fawcett’s colorblindness? The reproduction printed in Collier’s doesn’t show these adjustments, so maybe these where added by someone else later. I guess to find out, I’ll have to buy David Apatoff’s book and read his analysis. Because if anyone knows, it’s David. "I think Fawcett is the most literary artist who ever lived. Maybe the only artist who took literariness in and of itself as his visual aesthetic? Surely this innovation alone would merit him inclusion in the pantheon, were the doors open to those who have traditional talents." Kev, do you mind expanding on that a little? From some of your comments elsewhere I'd thought you didn't care much for literariness in pictures, do you mean that Fawcette made it work aesthetically better than others did? (as in, remained true to the literature without sacrificing that gut aesthetic response you keep talking about) I just want to make sure I'm not misunderstanding you. I'm also not sure what you mean by "literariness in and of itself as his visual aesthetic." Fawcett makes art like Tolstoy wrote novels. Every particular note is additive to the overall dramatic idea, and each captured detail is presented as something for both intellectual and emotional delectation. And the density of all this well-selected information becomes overwhelming with effect. I saw a couple of Fawcett pieces in a traveling show and I had my 9 yr old son with me- who is colorblind. He was blown away by them, which had me wondering if it had a "special" visual meaning (because I thought Fawcett was colorblind). I mean no matter what Fawcett is incomparable. I would be very interested to know more about Murray Tinkelman's ideas on colorblindness. Can there be any doubt that that lounging figure is in fact THE Homes? The book is terrific. I just got a copy, from Manuel's hands, in fact. High quality production as always. Great selection. Reminds me, yet again, why my teachers were in such awe of the man. Hi, I hope to see a copy soon, knowing how much you and Manuel put into it. Definitive for sure. congratulations David. I look forward to getting a copy of the book. I received the book today! Congrats Mr. Apatoff!!! A wonderful text and collection!! Got it today - thanks David ( and all involved ) for a book i'll enjoy and draw inspiration and insight from for the rest of my life . Amazing how he orchestrates such density of detail with zero clutter , the overlapping of forms is unmatched . ""Mr. Auad know he spent years tracking down hard-to-find tearsheets and originals of Fawcett's art in order to make this the definitive collection of the famed draftsman's work."" AWESOME, I seriously need to get this book! Should be a great read!!! अर्जुन-- If your comment is your gentle way of saying that you have located early examples of Fawcett's work that weren't in the book and which you have posted on your blog, that is certainly true. Where were you 5 years ago? Whilst on a travel through internet I landed here(!) …the post needed a little spammer-style enthusiasm. 5 years ago? Not that I was unaware (had On the Art of Drawing for sometime) but the work of Mr. Peng, Mr. Auad, and yourself, is the foundation of my Fawcett knowledge. I know there is more to find …the game is afoot!